I read this article and found it very interesting, thought it might be something for you. The article is called Five Things That Should Worry India and is located at https://archive.indiaspend.com/cover-story/five-things-that-should-worry-india-21381. The year 2015 began with unseasonal rainfall that damaged crops across 18 million hectares of farmland— about 30% of the rabi (winter) crop—according to a government estimate. Farmer suicides in Bundelkhand region in southeastern Uttar Pradesh grabbed the country’s attention, as India reported an agricultural growth rate of 0.2% in the last financial year. Agriculture, which supports 600 million Indians, faces significant distress. Over the past 20 years, the farm sector has experienced negative growth during five years; three of those were drought years. While India struggles with food insecurity and malnourishment, big bang reforms are needed for the agriculture sector. “The government had a unique opportunity afforded by the Bali package of the WTO (World Trade Organisation)—to reform the PDS (Public Distribution System) and domestic food subsidy regime—but it has shelved those plans and ignored the Shanta Kumar Committee report on reforming the Food Corporation of India. And no efforts are underway to set right the distorted fertiliser subsidy,” wrote economist Ajay Chibber in a recent column in The Indian Express . 2. Drought-like conditions in 302 of 640 districts; is India’s climate changing? 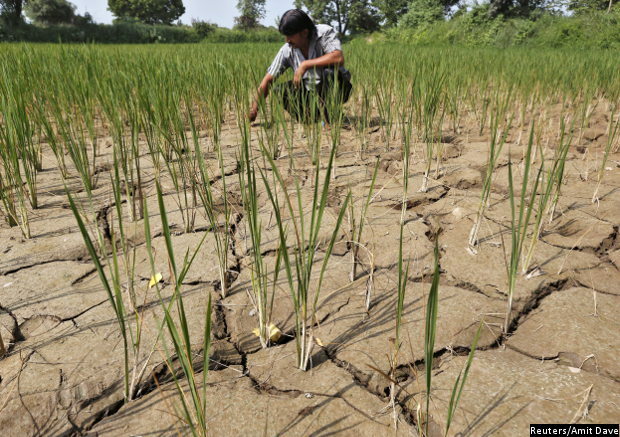 Nine of India’s 29 states–Uttar Pradesh, Maharashtra, Bihar, Chhattisgarh, Madhya Pradesh, Karnataka, Telangana, Odisha and West Bengal–declared a drought, seeking as much as Rs 20,000 crore in central aid. As many as 302 of the country’s 640 districts are living with drought-like conditions. There are strong links to climate change. Extreme rainfall events in central India–the core of the monsoon system–are increasing and moderate rainfall is decreasing–as a part of complex changes in local and world weather–according to a clutch of Indian and global studies reviewed by IndiaSpend in April. In 2014-15 alone, 92,180 cattle were lost, 725,390 houses damaged and 2.7 million hectares of crop area were affected. By 2020, yields of major crops, such as maize and wheat, could decline 18% and 6%, respectively, according to this report by the Indian Council of Agricultural Research. With 40 million, India still had the world’s largest number of stunted children (lesser than average height for the age), despite improvements; about 38.7% of all children. Nutrition disparities among the worse-off and better-off states were quite marked, according to government data. For example, in Jharkhand, 47% of children under five are stunted while the figure for Kerala is only 19%. As many as 42.1% children in Jharkhand are underweight, which is equivalent to Timor Leste (East Timor) with 45.3%. This shows that Jharkhand is worse off than countries like Yemen with 35.5% and Niger with 37.9%, according to World Health Organization data. The worse-off states are classified under ‘high focused states’, which receive special funds from the Centre to reduce malnutrition. Among the better-off states, Manipur has the fewest underweight children (14%), close to countries like Bhutan (12%) and Mauritius (13%). While more children have been immunised than before, the results of the Rapid Survey on Children, released in July, showed wide disparities between states. For example, immunisation data revealed that 56% of children were immunised in Gujarat, far below the national average (65.3%), and behind states typically described as “backward”, such as Bihar, Chhattisgarh and Jharkhand. India is home to 282 million illiterate people, as IndiaSpend reported earlier this year. The 2015-16 budget reduced spending on education by 16%. The allocation for the Ministry of Human Resource Development was 4.6% of the total expenditure in 2014-15–it was reduced to 3.9% in the 2015-16 union budget. The devolution reforms have increased the states’ share of divisible pool of tax revenue to 42% from 32%, but social sector allocations were cut. IndiaSpend reported how health and education sectors may be affected by such cuts. Average public spending on education across the world was 4.9% of GDP in 2010, while India spent only 3.3%, according to World Bank data. Nearly 18% of children who went to school were not able to complete secondary level of education, a fundamental right under the Constitution, data on dropout rates reveal. Note: GER, or Gross Enrolment Ratio, is the total enrolment, expressed as a percentage of eligible school-going age population for the level of education. The dropout rate is calculated by subtracting the sum of promotion and repetition from 100 in every grade. While the government has succeeded in ensuring full enrolment for children at entry level, 18% drop out before completing secondary level. Teachers are sub-standard and often absent, even as 80% of school expenditure is on teachers’ salaries. Earlier this year, in Maharashtra, 99% of primary school teachers failed annual evaluation exams; as Indiaspend reported, less than one in five teachers is adequately trained, despite spending $94 billion on training over the last decade. The bad news: Trade has dropped. The good news: Wholesale inflation is down; bad news again–it isn’t getting passed on to Indian consumers, which means prices have not come down. While India is on track to remain the world’s fastest-growing economy, growth forecasts have been slashed and there are significant worries, such as inflation, caused primarily by a surge in the prices of a food staple, lentils, which, as IndiaSpend reported, will remain. The consumer price index (CPI) and the wholesale price index (WPI) are the two indices that determine magnitude of inflation in the economy. The wholesale price index (WPI)–an indicator of prices of production and in which petroleum, iron and steel are major factors–dropped below zero, meaning deflation, in January 2015 and has remained negative at the year end. Falling prices of raw material and weak global commodity prices have driven down the WPI, which means India has been receiving raw material from the global market at lesser and lesser prices every month in 2015. A positive CPI, on the other hand, shows that the benefits of falling prices (indicated by the WPI) are not being passed on to consumers, Pronab Sen, chairman, National Statistical Commission, wrote in a column in The Indian Express. “Supply inefficiencies are worsening in India due to poor investment in infrastructure and rising transport and logistics costs–both for farm produce and industrial goods. This could have increased the gap between CPI and WPI”, observed R Jagannathan in this Firstpost column. While the falling WPI has been conducive for Indian products to be competitive in global market, Indian exports have fallen by more than 10% in April-November 2015 compared to same period last year, as shown in the following chart. Global economic slowdown coupled with weak demand in the international market has led to reduction in both imports and exports by more than 10% at the end of second quarter in 2015-16. Good analysis about wholesalers and not passing benefit to retail consumer s.